Over the last few years I have been working on accumulating nice clean photos of all the manufacture’s motocross models going back to their inception. As it turns out, that actually A LOT harder than it sounds because I was not looking for Googled photos of some guy’s Craig’s List ad, but the actual studio shots from when the bikes were new. For some models, that means going back to the early seventies and scrounging Ebay for original brochures and magazine tests. The results were a big hole in my bank account, but a awesome collection of classic motocross bike brochures. Personally, I love paper brochures and I lament the move to the internet for things like this. 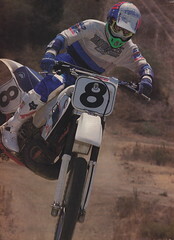 I use the photos and information in them quite a bit as well in crafting my Classic Steel articles for PulpMX.com. Maybe I am just old fashioned, but nothing beats seeing a classic bike when it was new and not yet run through the ringer by Billy Bob Mac and his cousin Ronnie. For this installment, I have gone through and accumulated all of Suzuki’s 80 class mini racers from 1977 through the latest 2019 model. The PDF below has them all featured in chronological order, with each year labeled to keep the yearly Bold New Graphics confusion to a minimum. I also did a YouTube video last year that I am including if you prefer to let the bikes just roll by with a little musical accompaniment. I hope everyone enjoys this walk through RM80/85 history. When I was 13, I used to just sit and stare at the RM80T brochure in 1980. My Parents couldn’t afford one. Used to picture myself riding and what it would be like. Not long after my Father bought me a used YZ80D and loved it. Now at 50 I still think that RM80 looks darn good, and have learnt that if you concentrate in picturing yourself doing things in your mind, your sub-conscious will manifest it to become reality. Thanks Tony for these old pics and articles.